The SNE-SS-BAZOOKA-PC is designed as retrofit accessory to Silvent BAZOOKA™ 4000 series air guns. The SHROUD is made of robust stainless steel or plastic coated option, which can withstand high ambient temperatures, mechanical wear, aggressive and corrosive environments and meets hygienic requirements from -200c to + 4000c. As well as protecting the Silvent blowing nozzle, the SNE Nozzle Shroud inducts air flow to assist in blowing efficiency and air stabilisation. 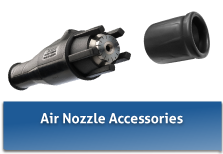 As well as protecting the Silvent blowing nozzle, the SNE Nozzle Shroud inducts air flow to assist in blowing efficiency and air stabilisation.